On this page you will find details on different techniques for Trolling, Chumming, and Jigging for Yellowfin Tuna. We hope this adds to the knowledge you already have and helps you increase your catch! It is no secret that if you want to find Yellowfin Tuna, find the birds first! A good radar can help immensely as your eye can only pick out a flock of birds at around 1/4 mile, while a super radar can see them at six miles if the waves aren't too big. 1. fish a limited number of lines, maximum five without a very experienced mate. 3. Fish our Tuna Plug or Bullnose Bubbler at around 175 feet back. 4. Fish a Tuna Plug, Bullnose Bubbler, Cone Head or Bird Chain around 100 feet back. 5. Fish one of the items listed in steps 2-4 or a daisy chain at 30 - 40 feet back on both left and right sides. 6. No need for outriggers as by fishing a lighter bait WFB, it will stay above the others. Fish heavier baits closer to the boat and make the distance between each bait substantial. You should be able to make turns without tangling your rigs, but always keep an eye out for problems. 7. Approach the school and always watch for the "lead bird" as when the school is on the move, there is usually a single bird in front of the pack following the Yellowfin Tuna. Remember this word "FOLLOWING". This means he is BEHIND the Tuna and if you want to present your baits without running over the school and not send them down, you must get in front of the school which means your boat usually needs to be 250 feet in front of the lead bird (depending on how close to the water he is). 8. With the baits you have deployed and without outriggers, you can run up to 15 knots to get in front of the school. 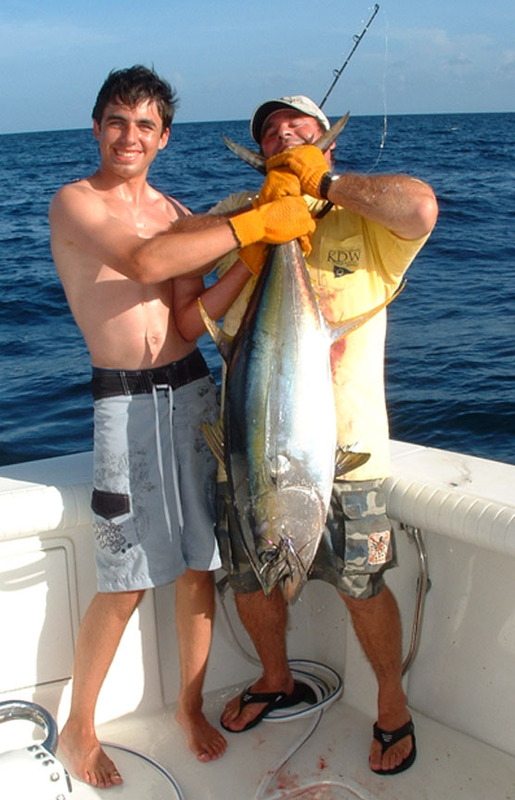 Play with the particular baits and distances to try to get your speeds over 20 knots if your Tuna keep moving hard. 9. Get in front of the moving school and slow down to 5-6 knots and try to troll with minimal wake as many Tuna are sensitive to wakes and this alone might send them down. 10. 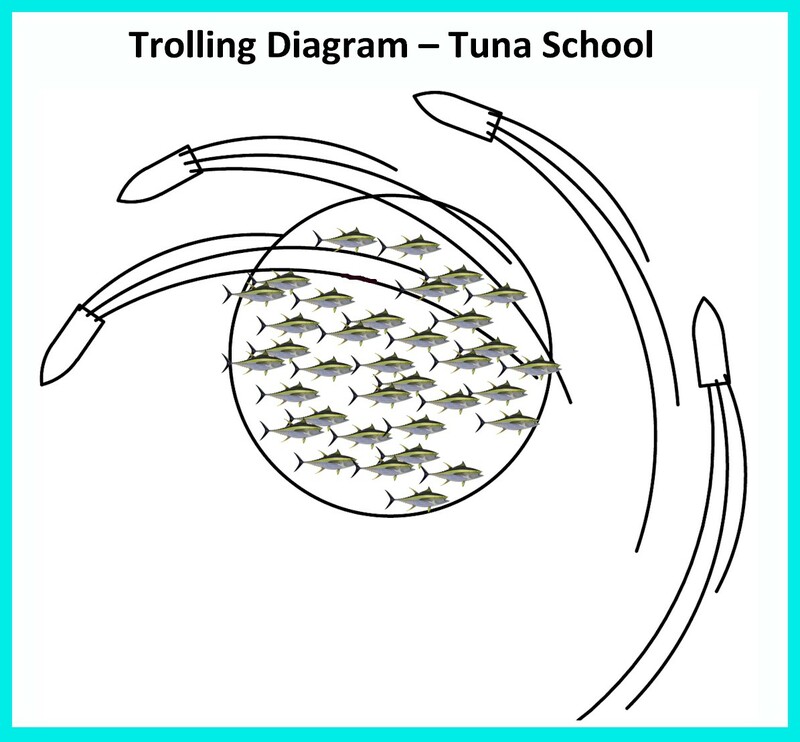 If the school of Yellowfin Tuna has stopped and they are feeding, troll circles around the fish trying to drag your baits through the school of fish but do not run over the fish with your boat. 11. When you get a bite, straighten the boat, DO NOT SLOW DOWN, as if you keep moving another 5 - 10 seconds you have a 40-50% chance to double (or triple) up. This will also give your angler time to get set up to fight the fish. (I just chartered a boat in Guam last week and the captain was complaining that we were only getting singles and he usually gets doubles, triples, and quads). I told him "do me a favor" and explained this to him. It took a couple of hook ups to get him to actually do it, but when he did, I first not tell him we were hooked up, then I would count down from five seconds and we would (every time except one) get a double, triple, or quad). One time it took seven seconds and just as he throttled back we hooked #2 & #3. 12. It is usually best to keep the boat moving when the fish gets close to control what he does rather than the other way around. 13. There is usually no need to bring in all of your lines unless you have a really strong or large fish that will require all of your attention. If the school of fish is behind the boat and you do not need to back down during your fight, your baits will be ready for a bite as soon as you gaff your fish and start moving again. I have actually gotten hits by Yellowfin Tuna just after putting the boat back in gear to start trolling again! 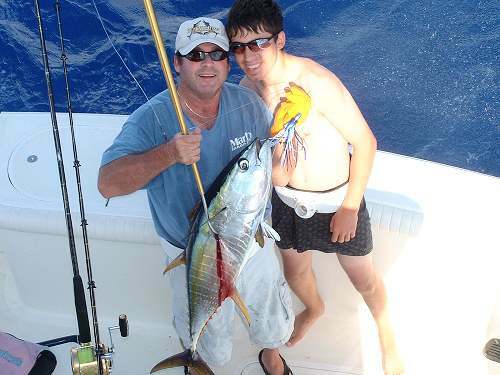 where you will find lures that work extremely well when targeting Tuna! There have been several articles regarding this technique over the last couple of years. It can be highly productive if you have the right weather, bait, and Tuna that are not on the move. First, catch (or obtain the bait). Pilchards, Greenies, Herring, Butterfishare, & Sardines all great choices. The fresher, the better. Cut up lots of chum into pieces around an inch wide and place in a one gallon bucket/s inside your cooler. Find the birds. See the Tuna. Have your lines baited up, have your chum ready, and get to the up current side of them (if you can figure out where that is) without running over the school. Hook baits can be cut pieces or whole fish. I like plugs made from cutting off the tail and the head. I then hook the bait near where the tail was for two reasons: this will keep the bait from spinning and it is a tough section keeping the hook from pulling out easily. Get your bait in the water by first peeling off around 40 feet of line onto the deck and throwing your hook baits as far as you can while also throwing at least 8 - 10 chunks of bait in the same spot you place each hook bait. Peel line off of your reels (with the clicker on) dumping free line into the water. Be carefull not to let line go under the boat or tangle with others, but the key is to let the bait sink without the line pulling on it so the bait sinks as naturally as possible. Continue throwing 8 - 10 pieces of chum into the water (wide spread) every 45 seconds of so. If you have let out so much line that your spool is starting to look empty, reel it back in and start over (assuming you are still on the fish). Do NOT reel in more than one line at a time because those baits are not fishing when you reel them. Use a light but strong hook that will not sink the bait any faster than neccessary. Use Florocarbon leader if you don't mind spending the extra $$ as the lighter the leader, the more frequent your hook ups will be. The longer the leader is, also the better your hook ups. If you use high vis or braided line, I would suggest 30' - 40' wind on leaders so the fish do not see your main line. If you use clear mono main line and you use small swivels, you can get away with shorter leaders. 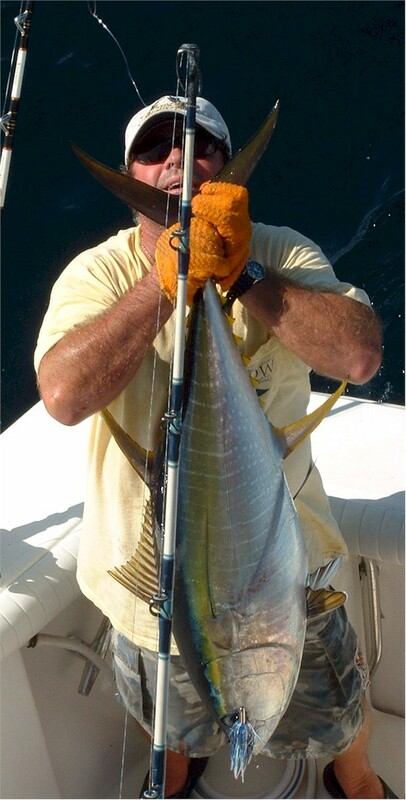 Do not over-sharpen hooks when fishing for Tuna as you want the hook to find its way to the corner of the mouth. Also good idea to consider using circle hooks. Be patient as you will need to peel off as much as 300' of line to allow the bait to get where the fish are. Just keep dumping line into the water. Pay attention as when you get a bite, you want to know it! Let the line go, but immediately start sliding your lever drag up. If using circle hooks, slide slower. If J Hooks, slide quickly. Try to keep your boat dead in the water and allow your other anglers to keep fishing while your hooked up angler fights. Even if the birds move away from you, keep chumming for several minutes to allow them to circle back. If the birds/fish don't come back, get on them again and start over. If the fish want to continue to move (chasing bait or looking for more) it will be best to employ the trolling techniques detailed above. There also have been several articles regarding this technique over the last couple of years. It can be highly productive if you have the right weather, jigs, and Tuna that are not on the move. You can employ jigs while fighting a Tuna that you have hooked trolling allowing your anglers the opportunity to hook up another fish!!! Find the birds. See the Tuna. Have your anglers ready, and get to the upwind or up-current side of them without running over the school. Jigs to employ include the Tormenter: Ballyhoo, Chubby Mini, Chubby Jr, Sardine, and Ribbonfish. You can even try the Anchovie if you are using lighter (braided) line and you have equipped it with a strong hook. Ballyhoo and Sardine should be rigged with our assist hooks. Pitch your jigs into the school of Tuna and allo them to sink anywhere from 60 - 100 feet deep. (somestimes deeper). Work your jigs back to the boat using the best technique for that jig. Pay attention as when you get a bite, you want to be on it!